The Lexington Art League partners up with PRHBTN to celebrate the contributions of local street artists for the seventh year of this popular public art festival. “Since its inception, we have been so impressed with the work of PRHBTN and their ability to present phenomenal works created by artists locally, regional and internationally which has enlivened our visual landscape”- “That is why we were delighted when PRHBTN reached out to us to present their annual commission-free exhibition in support of local artists.” stated Stephanie Harris, Executive Director, Lexington Art League. The mission of LAL & PRHBTN could not be more aligned for this partnership, with both entities believing that art should be accessible to all members of the community they are joining forces to strengthen the local aspect of this wildly popular annual festival. “The Lexington Art League was the most likely partner for this effort, as they not only support local artists through their on-going programs and exhibitions, they also support an international artists residency program that has resulted in several site speciﬁc art projects throughout the city and in the Loudoun House Galleries.” stated Jessica Winter, who co-founded PRHBTN with her husband John Winters. Introducing Said Dokins who painted the new mural in the courtyard at the Loudoun House. 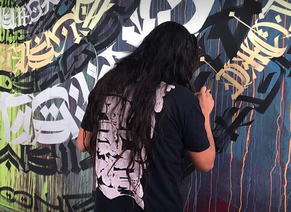 For Said Dokins calligraphy and graffiti are intermediate practices of inscription and trace, of twisting symbolic orders and of political enunciation. Dokins lives and works in Mexico City. His cultural practice takes on contemporary art production, research and cultural management. He has put on curatorial projects related to urban arts and a number of political issues happening in his country. Among other awards, is the winner of the Iberoamerican Contemporary Art Creation Prize, Cortes de Cadiz, Juan Luis Vasallo 2015 in Cadiz, Spain. His work as an artist has been shown nationally and internationally in countries as Spain, Germany, Holland, Belgium, United Kingdom, Argentina, Chile, Brasil, El Salvador, Peru and others. It takes up the economy of medieval calligraphy, the energy and expressiveness of japanese calligraphy, besides creating a poetic based on pre-phonetic writing. For Dokins every experience is a trace, a psychic impression that creates a texture in our symbolic universe. In that sense, calligraphy and graffiti aren't just on paper and ink, on the walls and spray, but on every event of our existence. ​​For first generation Colombian American graffiti artist, Jessica Sabogal, art serves as a haven, a tribute, a creative outlet of adoration and exaltation for women with stories often untold. Her pieces possess a vision of female identity that is revolutionary and powerful, brave and beautiful. By utilizing a spray can, she aims to color her canvas by unraveling stories she once heard, lived, struggled, and loved. ​In the past she’s been inspired by literary works written by poets, authors, and women of color, and have utilized their experiences and their existence as the sole muse for her creations. But most recently, she has created a line of work that honores the woman and female body as perfect. Her newest campain entitled, “Women Are Perfect (If You Let Them)” attempts to spread this simple but necessary notion worldwide. Keya Tama is a 19 year old South African street artist living in Los Angeles who has been producing murals and participating in exhibitions around the world since the age of thirteen. He is the son of celebrated street artist Faith 47 and influential tattoo artist Tyler B Murphy. So far he has had three solo shows, designed an international campaign for one of South Africa’s biggest clothing brands, and has released three independent graphic novels. He is a multi-talented artist simultaneously producing music, filming, animating, and painting walls, and he aims to bring all these elements together to create a new way of storytelling.